The Firefox web browser scales images automatically to fit the current browsing window. Users who do not like the behavior can take a look at our guide How To Disable Dynamic Image Resizing In Firefox to disable the feature. There are however other possibilities where images may need to be resized. This is for instance the case on forums where images break the forum layout when they are to large. 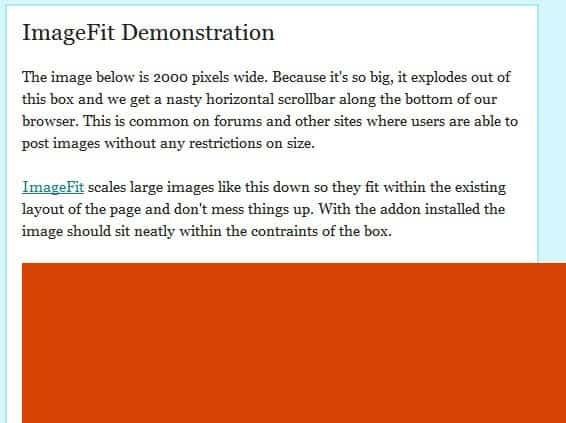 One way to resolve that issue is the ImageFit add-on for Firefox which has been designed for exactly that purpose. 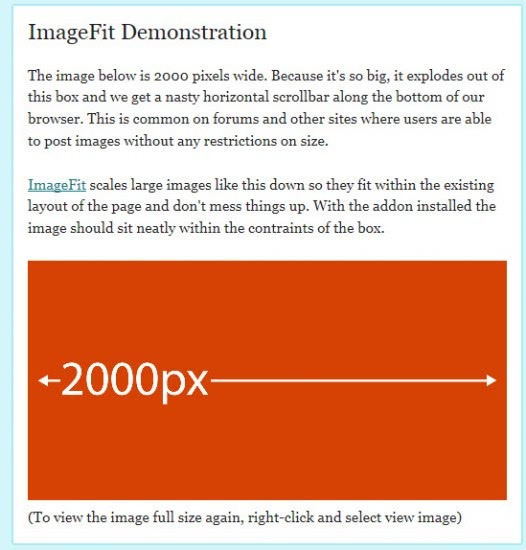 The extension "resizes large images in forum post and webpages" to automatically fit the layout of the site. It "shrinks images down to sit neatly within the existing layout of the page, using the surrounding elements as a guide". The developer has created a demonstration page. The effect is best demonstrated by visiting the page once without the extension installed, and then again with it installed. The image breaks the layout without the extension. A horizontal scroll bar is displayed on the screen which is needed to view the full image on the screen. The add-on improves the usability of web forums and websites where images that break the layout are often posted. ImageFit is compatible with all Firefox 3 and Firefox 4 releases. Update: The demo page is no longer available, the link as been removed as a consequence. The Firefox add-on itself has not been updated since 2011, but it is still working with the latest versions of the browser. The developer has added a blacklist to the application that blocks the extension from doing it deeds on domains added to it. The blacklist is maintained in the about:config configuration. Locate the parameter extensions.imagefit.domainBlacklist and double-click it to add domain names to it separated by comma.